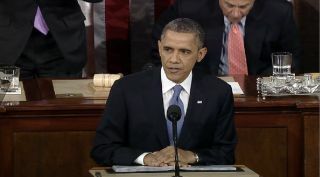 President Barack Obama delivers the annual State of the Union address on Feb. 12, 2013. The lack of attention given to space exploration in President Barack Obama's annual State of the Union address Tuesday night (Feb. 12) shouldn't make NASA and the space community nervous, experts say. Spaceflight and exploration received the barest of mentions in the speech, with President Obama invoking the Cold War space race once to highlight the need for increased scientific research and technological development. NASA didn't get a single shout-out. But that's par for the course for State of the Union speeches, experts say, and doesn't necessarily mean the Obama Administration places little value on the space agency or its work. "The small size of NASA's budget and impact compared to the issues of sequestration, defense [and the] social safety net often cause space to fade into the background," Hubbard told SPACE.com via email. Space policy expert John Logsdon voiced similar sentiments, saying the lack of space themes came as no surprise to him given the amount of ground the president had to cover in the speech. "Space issues are really not at the top of the national priority list," Logsdon, a professor emeritus at George Washington University, told SPACE.com. "In terms of things like climate change or the fiscal situation or gun control, space doesn't compete." While NASA didn't get a mention, the agency wasn't completely shut out of the State of the Union. Mars rover Curiosity flight director Bobak Ferdowsi — who gained fame as "Mohawk Guy" during the 1-ton rover's harrowing landing last August — sat in first lady Michelle Obama's box during the speech, along with a handful of other special guests. NASA and the space community will get a better idea of where they stand when President Obama releases the administration's federal budget request for fiscal year 2014, which should happen soon. "Of course we would have liked to hear him vocalize his support for a vigorous and sustainable space program — something that inspires Americans young and old, and that brings enormous benefits to the country," Commercial Spaceflight Federation president Michael Lopez-Alegria told SPACE.com via email. "Certainly there were other important topics competing for airtime; we're hopeful that he will continue to demonstrate such support through his budgets and policies." While most State of the Union addresses gloss over or ignore space, that's not always the case, notes Scott Pace, director of the Space Policy Institute at George Washington University. "President Reagan was an exception," Pace told SPACE.com via email. "He included major space elements in his 1984 and 1986 addresses." President Reagan's 1984 State of the Union included a call to build a permanently manned space station. His 1986 speech reaffirmed that goal and also stressed the need for a strong missile-defense system.